Chain-link fences are everywhere. So, why does this fencing type remain one of the most popular options year after year? Chain-link fencing is the perfect solution for homeowners looking to establish a strong, secure property line. Residential Chain-Link fencing is low-maintenance, highly durable, weather-resistant, and can last for nearly a lifetime. Plus, it’s affordable, both in up-front costs and in the long run, making it a wise investment. Residential Chain-Link fencing is also available in black and green for an upgraded look and even more strength. Why Consider Residential Chain-Link Fencing? Strength: Because it is made of steel, chain-link is the strongest fence material option available and therefore the ideal choice where security is the most important consideration. We can also create a stronger chain-link fence for your property by using thicker fabric (mesh), larger top rail, adding bottom rail, or tension wire, and even installing thicker posts. Durability: Chain-link fencing is galvanized, making it highly resistant to rusting. Black and green chain-link fences are vinyl coated, adding increased strength and beauty. A chain-link fence will stand strong day after day, no matter the environmental stresses you encounter on a frequent basis. Low relative cost: Chain-link fencing is possibly the most cost efficient material available on the market today. Even when dressed up with a color, it remains a bargain compared to other fence materials and other security solutions. Chain-link fencing from Ace provides commercial properties the added around-the-clock security our customers seek to safeguard valuable assets. 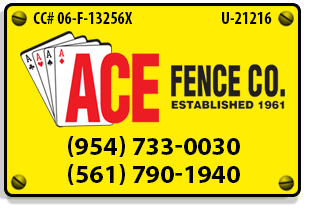 Ace fencing always meets or exceeds every structural code and wind load requirement in Broward and Palm Beach Counties. We meet or exceed your insurance requirements and provide a Peace of Mind Warranty with every job. We make gates that we install in our custom welding shop. We can therefore accommodate any specific size requests and control the quality of each gate’s manufacturing. This is another Ace distinction that offers our customers Peace of Mind. Still not sure if chain-link is the right material for you? Ace can help. All it takes is a few minutes of your time to learn about the possibilities that chain-link fence has to offer. Contact us to learn more. Ready to learn more? Click here to request a FREE Quote on Chain Link Fencing!